Posted on 28/1/2010, 6:08 am, by Colin Charles, under General. I wrote this before the Apple iPad announcement, so no thoughts on that yet, in this post. At the top of my head though, I’m still keeping my PRS-505, and not getting the iPad. In May 2008, I picked up a Sony Reader PRS-505. 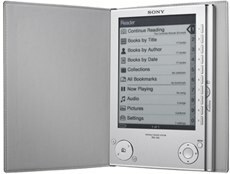 Its an e-book reader, and in the day, was definitely the flagship device from Sony, for electronic books and PDF reading. Today, Sony still sells this, and they also have models with a touchscreen, as well as a mini-version of this (a pocket reader?). I used the device on-and-off, mostly to read PDFs, but of late, I decided to read full-length books on it, and the quick verdict is a simple win! A bit about the device. It can be charged over USB (I did not opt to buy the AC charger), and uses a standard USB cable. It has a built-in rechargeable battery, and you’re meant to go for about 7,500 page turns. It does audio playback (which I never use), and it can read SD/MMC, as well as Memory Stick cards (again, I don’t use these options). It has over 128MB of storage available for you to store e-books, which seems plenty (failing which, the external storage options can be utilised). It looks like a book – comes encased in a soft leather cover. To turn pages, there are two sets of buttons, so I can read with one hand, or two. It also is based on opensource software. It runs MontaVista Linux, and Sony distribute all the GNU based software on the web (mixes of GPL/LGPL software being used). More importantly, I can sync e-books via my Linux or Mac OS X boxes – I’ve never actually used Windows for this task. I can successfully import and export books to the Reader, using calibre. So, why a Sony Reader rather than an Amazon Kindle? Simply, it boils down to availability. I don’t live in the United States, and Amazon tells me I can’t get myself a Kindle. I’d love one – the ability to buy a few books at 3am, to peruse on a topic I’m interested in? That sort of thing is priceless. I don’t even care about the DRM that they impose, the fact that they can come in and delete my purchases. Its the convenience that matters (beats going down to Borders the next day, finding I might have to wait for a title, etc.). That aside, I also do not buy books that have been inflicted with DRM, from Sony. I’ve been burned once before – when the Palm Pilot’s were the craze around ~1998, I did buy a few titles. Last I checked, I can’t access them anymore, and for the life of me, I don’t own a Palm device capable of reading that stuff. What do I read? PDF’s, mostly. Of books, of course. Today, O’Reilly’s Safari Bookshelf is really useful. For about 10 tokens, I usually can download a whole book. I’ve been doing this from time to time over the years, and now, instead of reading them on my workstation, I read them on the Sony Reader. Apress isn’t far behind, as most of their books have PDF versions to boot. So my technical reading material is covered. calibre also allows me to read bundles of Newsweek, The Economist, and the like. I used to use this, but I tend to visit a library once a week once, at least, and end up reading the dead tree copies that are there. Reading fiction and non-fiction is admittedly harder – author/publisher buy-in is very sparse, and I’m sure I’ll have better luck with the Kindle here. What don’t I like about the device? There’s no backlight. I’d like to read in the dark sometimes, and having lighting is inconvenient, so it would be great if it were backlit. While I can bookmark pages, I cannot highlight text, or even write notes about what I’m reading, inside the Sony Reader. In contrast, if I use the iPhone/iPod Touch to read a book, I get a nice backlight, and I can copy text out, as well as make notes in the notepad. Of course, I don’t get 7,500 page turns on such a device, but if I can squeeze about 20 hours of reading off any device, I’d be pretty happy (think: long flight). Text from PDFs can be a bit too small. They don’t seem to use up all of the available space, which is truly annoying. Zoom options are available, but there are only two supported sizes: S or M. M makes for easier reading, but I wish it took up more of the device. I’d rather have more page turns, than bad eyes over the years! Bringing Nothing to the Party: True Confessions of a New Media Whore by Paul Carr. Most interesting, I’ve completely read this already, and should post up a review soon. Coders at Work by Peter Seibel. I just finished a couple of chapters, and am going strong here. Two of the above are author released PDFs, while one is from O’Reilly’s Safari Bookshelf and the other an outright purchase from Apress. Would I recommend one? Sure. If you like reading, have a tonne of PDF’s in ~/Downloads, its about time you got yourself a Sony Reader. Would I recommend one if you already have an iPhone/iPod Touch? Sure (I have an iPod Touch, too!). I think they’re two different devices, and its not time to converge them just yet (maybe, if the iPod Touch had a bigger screen). Do you have an e-book reader? Where are you getting your fix of content?